The Great War poets need little introduction here; the work of Graves, Owen and Sassoon among others has come – rightly or wrongly – to symbolise the war. But there are many lesser known poetical voices often highlighting areas not covered in the mainstream work. A fine piece of poetry by two such poets – Bernard Newman and Harold Arpthorp – is just one example. The Road To La Bassée was written in 1934 following a visit by these two Great War veterans to the battlefields where they were amazed to find the fields they had once known, touched then by the cruel hand of war, had returned to normality – and life continued. It is a poem with hope – that the war had been fought to return the world back to normality and that long may that normality continue – and then the sacrifice had not been in vain. 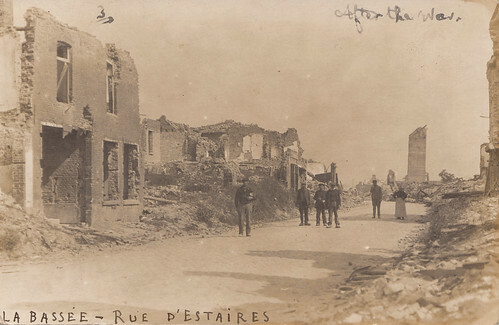 The image above shows the shattered La Bassée in 1920, looking as it did when the war ended. Few buildings are left standing and the tower seen in the background was a concrete German observation tower built into a former grain tower. By then it was part of the Zone Rouge – the devastated area of France where the fighting had taken place. Newman and Arpthorp’s work deserves to be better known. The trenches have been all filled in – the country’s looking fine. You’d never think there’d been a war, the country’s looking fine. – There’s buses running now from Bethune to La Bassée! I felt inclined to bob down quick – Jerry sniper in that trench! For there, at Tourbieres crossroads – a gaudy ice-cream cart! Ices didn’t seem quite decent on the road to La Bassée. The Somme’s a blooming garden, and there are roses in Peronne. And there’s kiddies now in Plugstreet, and mamselles in Armentiers. As those buses running smoothly over what was No Man’s Land. The journey used to take four years, but now it’s half an hour. Four years to half an hour – the best speedup I’ve met. Four years? Aye, longer still for some – they haven’t got there yet. Yes, I wondered what they’d think of it, those mates of mine who died. This entry was posted on 05/11/2012 by sommecourt. It was filed under Battlefields, France, Great War, Remembrance, Veterans, WW1 and was tagged with La Bassee, Remembrance, War Poetry, WW1. I think we often forget that for many of these young men their participation in what was very likely the greatest public event in their lifetime, brought for them both the best – and the worst – of times.